Gionee P4 Phone is a mid-range Android smartphone released and manufactured by chinese company Gionee last year. This phone comes with amazing 4.50-inch 480×854 display powered by 1.3GHz processor and also contains 1GB RAM and 5-megapixel rear camera. It is a tough competitor to other mid-range devices like Moto E and others. Recently it got kitkat update aka android 4.4 in India which is Over-the-air of the size of 808 MB in size. After the update , many users were looking for rooting solution for their updated gionee p4 smartphone thus here we are going to present tutorial on how to root their gionee P4 android smartphone and unleash its true potential. Disclaimer : There is always a risk in rooting Android phones so try at your own risk. TheDroidWay and its team are not responsible for any kind of damages occuring to your Android smartphone. Our tutorials are well tested and working but still we cannot assure you so be prepared for any damages. In case of any problem , we are here to help you anytime. 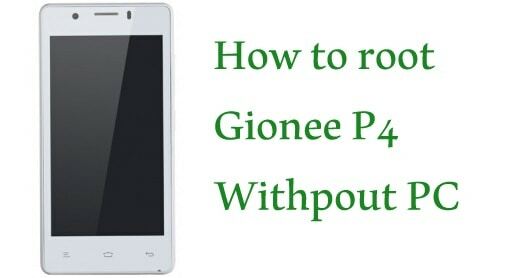 There are two available methods for rooting your Gionee P4 Android Smartphone among which first one is tested one so try second one only if first method doesn’t work for you. Make Backup of your android device. Once the process is finished, you will notice tick mark in the center. Which means your device is now rooted. Enjoy rooting applications and other tweaks. You can also enjoy the benefits of xposed modules. Learn How to install xposed in your device. If you want to verify whether your device is rooted or not, you can download root checker app from the play store to verify. Download the vroot program in your PC. Make sure you have enabled USB Debugging in your android device from settings. First of all install vroot in your PC from the downloaded file by following the on-screen instructions. Make sure that your PC is able to detect your device so that you can move further. Next, Click on the Green ROOT button to initiate the rooting process. It will hardly take few minutes to finish. Program will prompt you when the rooting is finished and then your device will be rebooted itself. FINISH!! You have now rooted your phone. Now enjoy post-rooting benefits in your smartphone. In case of any problem, don’t hesitate to contact us. We are here to help you. its not working. with kingroot its stucks at 69% and after few minutes an error comes…. with vroot when i connect my p4 the vroot stucks at connecting and never go more of it! Can I unroot my Gionee P4 because after rooting and using it for sometime,my snapchat is not opening anymore. I’m using kingroot app by that my Gionee P4 is susesfully rooted but when I restart the mobile. .The root checker apps show your devices is not rooted? ? What can I do now? ?? Any body help me? ? Cant root my gionee p4 using king root app why?